One of our early lessons in Turtle Art might prompt students to spend five minutes exploring the different tools on their own. They often initially think that the Right and Left commands mean the turtle will move those directions (they actually mean the turtle will rotate those directions), which leads to confusion on their part when the turtle stays put. So we come together for discussion, and define what the different commands do as a class: “Forward must not mean up. It looks like it means whatever direction the turtle is facing. 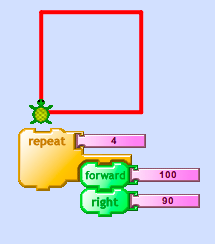 And when we click Right and Left, the turtle seems to be turning those directions, not moving them.” Once students discover that they can make the turtle turn “sideways” by entering Right 90, (for 90 degrees), teachers can start a discussion on angles. “What happens when you enter 180? What about 360?” And then, “Can you use what we’ve learned to draw a square?” Some students will inevitably struggle with putting these pieces together, but one trick to help them conceptualize the turtle’s movement is to have them physically walk out a path around the classroom while describing the steps they are taking.